Designed for the extreme demands of slate roofs, TopSlate is ideal for applications which require maximum longevity and strength. It is as durable as the slate roof it completes and strengthens weak, wind-vulnerable perimeters. Castle Metal Products offers TopSlate Ridges with optional vents and baffles. 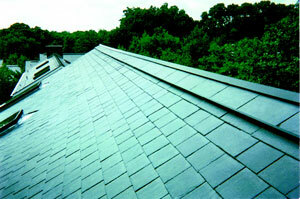 TopSlate Ridges eliminate the unsightliness of roof cement, seams, and exposed fasteners. The elegant simplicity of slate installation typically comes to a sticky, messy halt when the final perimeter slates are applied. In conventional installation, roof cement is used in an attempt to fill ridge and hip seams and to cover nail holes. However, roof cement only lasts 5-10 years when exposed, which means it is not compatible with best practice slate installation. High-grade slate lasts 75-125 years, which means it needs a finishing component that is of equal longevity and quality. The principle components of TopSlate are made to last because they are 2.5 times thicker than typical, prefabricated, external flashings and vents. Interlocking 10-foot sections, snap-caps, and drop-in slate attachments speed the installation of TopSlate Ridges. TopSlate units are permanently fixed to the roof with a unique internal anchor. An 8-12-inch lag screw and the vice-like action they produce clamps the unit and underlying slate courses to the roof. This creates the strongest, most durable ridge, hip, and vent in the industry. In conventional installation, ridge and hip slates are badly nailed. Nails must be placed in the slate’s corners or along their upper edges; however, these are the most fragile areas of the slate and provide the least resistance to wind uplift. Neither Castle Metal Products nor TopSlate’s developer nor it’s licensor shall be liable for special, indirect or consequential damages. The liability of Castle Metal Products (and that of TopSlate’s developer and it’s licensor), in the event of sale of it’s products, shall be limited to replacement by Castle Metal Products of any defective or nonconforming products or refund of the purchase price. Notice: All information is thought to be accurate but is not guaranteed and is subject to change without notice.